A little note from the editor: We’ve had a bit of time to reflect on the games we saw and played at E3, and it may be time to select “winners”. Part of that process feels unfair: E3 as a show has games that are available any minute now, and games that are years away. I don’t feel it’s fair to compare the two. So: we’ve decided to split out awards into two categories. Today’s awards are for games we could play, games that publishers and developers were brave enough to let the press and public touch. Tomorrow, we’ll look at everything else: games that were presented via stage show or controlled demo. I accidentally built a demon’s chillout pad. He had rugs, bookcases, a nice chair and a beautiful pair of lamps. He could kill an adventurer in a careless adventurer in a single thought… but he also loved his comfy slippers. Sword Coast Legends is batshit brilliant. And I can’t stop thinking about it. Off the convention floor, n-Space, a group of former Bioware developers now independent, hosted a LAN party. Five PC’s all running a demonstration of Sword Coast Legends. It was bliss: a procedurally generated dungeon, four heroes, and a dungeon master. Sword Coast is sort of a traditional RPG in the mould of Baldur’s Gate or Neverwinter Nights, but it’s meant to be played together. Co-op against the campaign, or with a dungeon master pulling the strings. At E3, I played as the dungeon master, and fell completely in love. What struck me about Sword Coast Legends wasn’t just its DnD mechanics, even if they’re a near perfect replica of the current system. It’s worth pointing out that the game is an official DnD project, being published by Digital Extremes (with a license and a lot of support from Wizards of the Coast) – if only to tick off the box that says “it’s respectful”. What struck me more was the implementation of improv. As Tim Schwalk , the game’s design director pointed out to me, “Dungeons and Dragons is not a competitive experience. It’s meant to be shared enjoyment.” The best dungeon masters get a kick from seeing their heroes succeed. As the heroes enter a dungeon, you’re able to manipulate encounters on the fly. You can take control of individual monsters, or spawn new ones, add new scenery, block off passages or lay traps, all on the fly. During one encounter with a giant spider, I spent my accumulated DM points on forty mini-spider eggs that were released when the spider queen died. The yelps from the heroes were worth every point. Another time, I took control of a single grunt and sent it on a ludicrous chase, hoping to lead the team into a set of poison traps. It works. The editor is slick, swift and a joy to tinker with. The game is robust, detailed and full of characters, peoples, enemies and props that themselves can be colour swapped, equipped or altered. The potential for mods and campaigns, shared through n-Space’s bespoke (and admittedly untested) online service – my only real worry about the game – is fundamentally exciting. Of all the games I played at E3 Sword Coast Legends is the one I can’t wait to touch again. Mirror’s Edge has to be the perfect example of a game that everyone really, really wants to be good, that you want to be so good that you sort of convince yourself it is. But real talk: the original Mirror’s Edge may have created a beautiful world, but otherwise plopped the player into an impressively inane video game story while simultaneously choking all the joy out of parkour by alternating restrictive puzzle sequences with “desperately avoid being shot to death” gauntlets. Despite all that, it’s hard not to be pleased to see EA give Mirror’s Edge another chance. Our E3 demo was very much that—a demo—so it’s hard to accurately gauge how successful the final product is going to be, but we were dropped in front of the controller with four distinct segments on offer—first, a brief taste of the story, as we’re introduced to Faith once again, released from some kind of future prison and, in that way video game protagonists just do what they’re told, inducted into the ranks of the “runners” by sticking a view-screen thingy into in her eye. The story apparently goes deeper into Faith’s past—they’ve made a big show of pictures of Faith looking sad and lonely as a wee girl—and places her between the controlling ruler of the City of Glass, Gabriel Krueger and Black November, a group of possible terrorists. But that’s really not much to go on, so the plot could still be utter toot. The second segment of the demo offered up a tiny chunk of the open world. That’s where Mirror’s Edge Catalyst shone. Given the option of three waypoints, all showing different parts of the game (combat, racing, and climbing puzzles) Faith was a pleasure to control and the new “dynamic” runner vision—which reacts to the chosen waypoint, making sure you’re always clear on the best way to progress—meant that you could really get down to the business of “flowing” through the world. Every segment—even the climbing puzzle section which tasked Faith with climbing up to a billboard to hack it—engendered the feeling of free running, and honestly made me excited that the full game could feel this good. Combat was satisfyingly crunchy; Faith might not fire any guns, but she’s perfectly happy to snap a guy’s arm with a Batman-esque gusto, the context-sensitive moves quick and effortless to pull off. After I’d completed all the segments I even found some time to run around the world grabbing some collectibles, and it was just joyful to move around the world in a way I haven’t felt since I last played Crackdown on the Xbox, or something. Frankly, Mirror’s Edge Catalyst has the chance to be the Mirror’s Edge game we always wanted, and I can’t wait. 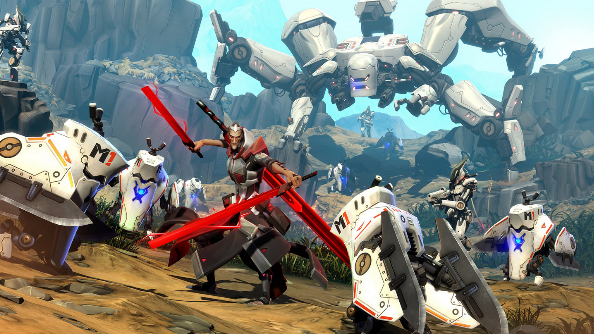 Battleborn sits somewhere between Borderlands and Destiny. It’s a co-op PC shooter from the team that produced Borderlands, but with a wider, vaguer palette of heroes, and a broader range of modes. As well as a co-op story mode, it has deathmatch and team multiplayer. 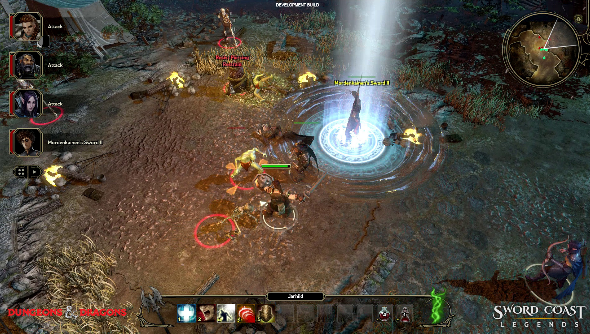 It has way more characters: twenty plus, with their own unique set of talents and abilities, including dedicated healers, melee and pet classes. I played it for a good half-an-hour, running a co-op mission that took in waves of angry robots and escorting a tank with a giant eyeball laser. Battleborn retains Borderland’s sense of the absurd; but it feels slicker, faster, more refined. I think it’s going to be huge.